Freelance vs Self Employed – Is There a Difference? 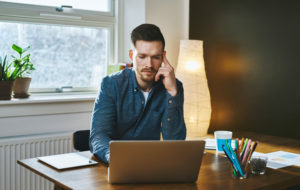 Home › Next Insurance Blog › Small Business › Freelance vs Self Employed – Is There a Difference? Freelance vs. self-employed, that is the question. Or is it? While you know that you’re not an employee because you don’t work for a company, you may be wondering what your employment status should actually be called. For starters, let’s define some terms. Is freelance employment the same thing as being self-employed? In casual talk, the simple answer is pretty much yes. By legal standards, freelance or self-employed are about the same thing, so why are there two terms out there? Some people don’t like the term freelancer. They think it sounds less serious than self-employed. That’s because in many people’s minds freelancers are more gig oriented. That is, they shell short bursts of time to get a project done. The term self-employed, on the other hand, brings up connotations of building a business. This often makes self-employed the preferred term for more entrepreneurial-minded people. People who define themselves as freelancers tend to work alone. A self-employed person on the other hand is more likely to have (or want) employees, for the reasons we discussed above–building a business sometimes requires others, freelancing tends not to in terms of perception. There’s also the idea of selling services rather than ideas. Many people see freelancers as professionals who sell services (like content writers or graphic artists), and the self-employed as people who sell ideas. Then there’s the issue of how you see your time. A freelancer can often feel like they’re still working for someone, especially if they’re working a lot of hours consistently on a project. A self-employed person tends to feel more autonomy. Again, this is a matter of outlook more than anything concrete. All that being said, when it comes to money time, there’s no clear winner in defining yourself as freelance vs. self-employed. Some independent freelancers can make way more money than a self-employed individual, even one with employees. And some self-employed people value having employees over the salary they may bring in today. Whichever way you choose to label yourself, there are certain things in common between both terms. For example, you will need to register as self-employed. How to register as self-employed? There are a number of things you’ll need to do. What exactly depends on the nature of your business, and where you live. You may want to contact a lawyer, accountant, or the local office of the Small Business Administration (SBA) to help you out. Also remember, certain professions require licensing, so make sure to take care of that before you go and register. The Taxing Side – Do Freelancers Pay Taxes? Keep in mind, paying taxes as a freelancer is your responsibility. Once you’ve registered your business with the proper authorities, there are a number of freelance business taxes you’ll need to address on the federal, state and local level. The IRS checklist is a good place to start, but you’ll also need to do a bit of research for your local and state requirements. If you’re already wondering how much you’ll pay at the end of the year, there are plenty of freelance income tax calculator tools available online to help you out. The amount you pay will of course depend on things like your age, gender, and marital status – all things you’ll need to check off on your freelance income tax form when you file. As for freelance tax deductions, there are plenty of those available. These can include obvious things like your office space, office supplies, and travel expenses. However, don’t forget to include things like any advertising and marketing services you use, premiums paid for health insurance, and even professional development courses. Doing taxes as a freelancer, bottom line, isn’t all that fun. But with good planning and a little research, it should get easier over time. Plus, if you have the budget, you can always hire a consultant of your own, in the form of a freelance or self-employed accountant or tax advisor. Whether you’re going with calling yourself freelance vs. self-employed, your insurance needs stay the same. That means you need good coverage, for yourself and anyone you’re working with you. Needless to say, this begins with general liability coverage for your business. Other forms of insurance strongly recommended include health insurance, auto insurance (if you have a car), and workers’ comp (if you have employees). Is Personal Trainer Liability Insurance Necessary?